Louis Althusser's Letter on the "May Events"
Louis Althusser's preliminary analysis of May 1968, written in a 1969 letter to Maria Antonietta Macciocchi. 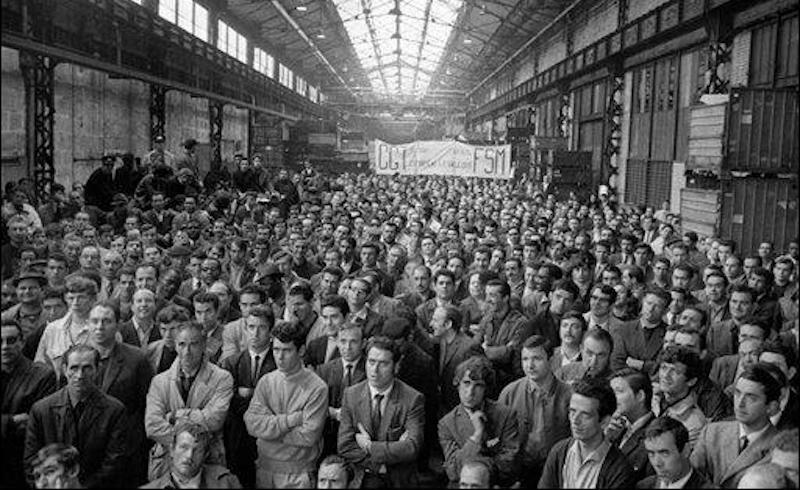 Striking Citroën workers listen to a CGT representative, May 24, 1969.
Letters from Inside the Italian Communist Party to Louis Althusser, published in Italy and France in 1969 and translated into English for New Left Books' 1973 edition by Stephen N. Hellman, contains a remarkable sequence of exchanges between the French philosopher and Maria Antonietta Macciocchi. Paris correspondent for l'Unita, Macciocchi was called back to Italy in late 1967 by the PCI to stand as a candidate in Naples for the 1968 elections. "My major reason for accepting this offer," Macciocchi writes, "was a desire and a need to find out the truth of what was going on in my country and my party...It was this same need to find out the truth which led me to suggest, before leaving Paris, a project of correspondence to the Communist philosopher, Louis Althusser." Althusser's letter below, dated March 1969, constitutes Althusser's preliminary analysis of the May 1968 events, composed at Macciocchi's request. I promised, when I saw you last summer, in the heat of July, that I would write something on the events of May and on the Student Movement. I see now that this was, in many ways, a foolish promise to have made. For how could anyone presume to speak of events of this kind without having a minimum of objective documentation at his disposal? How can anyone presume to speak of an important historic event without that minimum of objective information which would allow one, if not to carry out in full, then at least to outline "the concrete analysis" of "the concrete situation" that produced the May events? Given my forced withdrawal, due to illness, I did not have that necessary information last summer. Today, I still only have a few things on the "Student Movement." I am lacking the really essential material: what, exactly, happened in the working class and among the broad strata of (non-proletarian) employees who together made the portentous May general strike. The articles which have appeared in l'Humanité and a few other scattered reports only furnish the most general elements of an analysis. Under such circumstances, anything I can say can only be very schematic, crude, and perhaps even fundamentally incomplete. I originally hoped to send you my analysis in the form of theses. Instead, what I have are, at best, hypotheses. But these qualifications do not mean that we should wait indefinitely, i.e. wait until it is possible to carry out a truly Marxist historical study or (which really amounts to the same thing) a truly Marxist political analysis (a concrete analysis of a concrete situation). We have to say what we can. We should of course be careful, but we must say something. We have to do this in order to submit our hypotheses to the criticism of our comrades, so that something more than hypotheses will result and, above all, so that we will be able to see things a little more clearly in the post-May situation. For something of great importance happened in May, something of the greatest importance for revolutionary prospects in the "capitalist countries of the West," something which must have repercussions on our policies, or else our policies will risk being "dragged along" by events. And I do not mean by the events of May, which now are a part of the past, but by present and future events which, one day, are going to go far beyond those of May. This, then, is how I will proceed. I will put forward two Facts, one Thesis, and at the same time one Hypothesis. By Facts I mean incontestable facts, historic facts in the strongest sense of the term, i.e. constituent facts of the national and international conjuncture. By Thesis I mean a demonstrable political or theoretical proposition. By Hypothesis I mean a political or theoretical proposition which I cannot demonstrate conclusively, either for lack of space (one cannot go on forever in a letter), or else for lack of information that could only be provided by objective sociological inquiries "in the field." I will follow a relatively arbitrary order in what I am about to write. It is, primarily, a pedagogical order, though subordinated to the primacy of politics. Consequently, my Facts (Facts I and II), my Thesis (Thesis I) and my Hypothesis (Hypothesis I) will be presented in a mixed order. The absolutely determining role in the events of May was played, in the final analysis, by the general strike of nine million workers. The mass participation of university students, secondary school students, and young intellectual workers in the May events was an extremely important phenomenon, but it was subordinated to the economic class struggle of the nine million workers. This brings us to the first fact: in the comments and interpretations currently being put on the market in our capitalist countries, the relative order of importance of these two phenomena (the general strike and the "student" actions) has been completely reversed. In contrast, this reversal is found in all bourgeois and petty-bourgeois publications, including the majority of Student Movement publications. Aside from de Gaulle's imprecations, which directly attacked the "totalitarian" working class, and aside from a few manifestos of the Action Committees, these publications all push the general strike into the background: no one mentions it any more. They simply erase from history the greatest workers' strike in the history of the world. What is brought into the foreground, in its place, is the Student Movement, the barricades of the Latin Quarter, and so on, as if, given the importance of these phenomena, History could be made by petty-bourgeois students, "who lead the working class towards the Revolution..."
I know that some students do not fall into this bourgeois trap. At least they do not do so in writing, where they clearly recognize the primacy of the May general strike over the May student actions. But it is not enough to write down a correct Thesis: it is also necessary for this Thesis to pass from the heads of the limited number of "conscious" students who write it into (a) their own actions, and then (b) the concrete line of action of the Student Movement as a whole. Now I would contend that the present concrete line of action of the Student Movement contradicts in practice, with a few notable exceptions, this correct Thesis. The line of action of the Student Movement reflects the "ideas" of the Student Movement, in other words the ideas of the vast bulk of the students. And the vast bulk of the students still believes that the actions of the students played the determining role in the May events. The mass of the students live in a dream based on a misunderstanding. On the grounds that (and this is an historico-chronological fact) the savage repression of their "barricades" served as a "detonator" to the general strike, the mass of the students thinks that they were the vanguard in May, leading the workers actions. This obviously is an illusion. It confuses chronological order (the barricades came before the 13 May demonstration and therefore before the general strike), the role of "detonator" or "the single spark that lights a forest fire" (Lenin), with the historical (non-chronological) role which is determinant in the final analysis. And in May it was the working class, and not the students, who, in the final analysis, played the determining role. To the extent that the Student Movement (French, German, Japanese, American, Italian, or whichever) does not recognize this fact in theory (in its writings) and, above all, in practice (in its "line" and in its forms of organization and action), its interpretation of the May events simply merges with the bourgeois and petty-bourgeois interpretations of May. The students' interpretation is only — in a linguistic form appropriate to the variations of ideology in the student "organizations" (libertarian, neo-Luxemburgist, Guevarist ideologies) — the pure and simple demarcation of the bourgeois interpretations. The students must become aware of this fact: that they are contributing objectively — in their own way, of course, and in spite of the subjectively revolutionary intentions of the best of them — to the bourgeoisie's reversal of the real order of things, i.e. to the passing over in silence of what, in the final analysis, played an absolutely determining role in May, that is, the general strike of nine million workers. In order to convince the students of this reality, which they have not recognized, I will make two observations for their benefit. Both these observations refer to the occupation of the Sorbonne. The students reoccupied the Sorbonne and raised the red flag over it during the 13 May demonstration. That they were able to reoccupy and then "hold" the Sorbonne for such a long time was due, it is clear, first, to the presence of hundreds of thousands of workers on the 13 May demonstration and, secondly, to the massive general strike which broke out thereafter. This general strike mobilized the bulk of the repressive apparatus of the state on a front which represented a much greater danger to the bourgeoisie than did the "student front." And, without this strike and mobilization, it is most unlikely that the occupation of the Sorbonne would have lasted more than a few days, at most. This same occupation presented an objective problem to the students. But because they were too confident in a strength they thought was theirs alone — and which, on the contrary, derived essentially from the power of the general strike — they never gave it a moment's thought. For an occupation, even if only an occupation of the Sorbonne, cannot be improvised. Now, even if the students had no experience with factory occupations (and this is understandable since these events were their first test "under fire"), there were men who were already experts in the practice of occupation. I am of course referring to the workers, who, having "inaugurated" this form of struggle in 1936 and extended and refined it on numerous other occasions since then, had not forgotten what they had learned. The proof can be seen in the exemplary success of the factory occupations in May–June 1968. Instead of simply going to the factory gates to "offer their help" to the workers, the Sorbonne students should at the same time have asked the militant workers of these factories to come to the Sorbonne to teach them how to carry out an occupation effectively; how to defend the Sorbonne against the intrusion of undesirable elements and police agents, who instead — as is well known — were able to come and go as they pleased; how if necessary to defend the Sorbonne against the assaults of the repressive forces. Then the occupied Sorbonne might have become one of the most significant terrains of the class struggle in May, where the fusion of student actions and the workers' struggle could perhaps have begun to take shape. Here too, things have to be clearly stated: the students thought that it was the workers who needed them, while in reality it was the students, novices in this form of struggle, who needed the most "help," in the form of advice and support from the working class. We can see from this example what the practical consequences can be — indeed, always are — of a correct, or erroneous, estimate of the relative importance of the forces involved in an "encounter." If the encounter of 13 May has, essentially, had no sequel; and if, after May, such a sequel — which will come one day — seems, provisionally, farther off than ever; this is due, at least in terms of what we are discussing here, to the false evaluation of the real order of importance of the forces involved. For this reason, things must be put in proper perspective. It is for this reason that the following Thesis is important. 1. The action of the economic and political class struggle of the mass of French workers and employees: i.e. the general strike of nine million men and women that lasted a month. This action of the masses was the historically determining element, in the final analysis, of the "May Events." 2. The actions of the university students, secondary school students, and young intellectual workers, for whom the repressive acts of the Government and police provided the spark for a magnificent explosion. (These repressive acts were objectively "clumsy," from a bourgeois point of view: since May, the politicians and the representatives of the bourgeois state apparatus have "caught on" and now they behave accordingly, i.e. with more proper bourgeois manners.) The explosion reached its high point on the barricades on the night of 11 May, and afterwards in the occupation of the Sorbonne, the Odéon, and other pillars of culture. What happened was an historic encounter, and not a fusion. An encounter may occur or not occur. It can be a "brief encounter," relatively accidental, in which case it will not lead to any fusion of forces. This was the case in May, where the meeting between workers/ employees on the one hand and students and young intellectual workers on the other was a brief encounter which did not lead, for a whole series of reasons I will mention very briefly and very generally, to any kind of fusion. An encounter which is, or becomes, a long encounter must necessarily take the form of a fusion. This did not happen in May. Developments since May confirm this thesis: the fusion of the workers' movement and the actions of students and others is still not objectively on the agenda. For it to be put on the agenda the non-proletarian youth will have to come a very long way from where they presently are, and the Workers' Movement (yes, it too) will also have to move a certain distance. As long as this distance is not traversed by both sides (and each side must cover, on its own, the distance in front of it), the fusion of the two will not be on the agenda. And in the meantime, the Workers' Movement will follow its own path and the non-proletarian youth will follow its hesitant route. Starting from this Thesis I, we can give some order to the chronology of things by subordinating it to History. The encounter took place, in the proper sense of the word, in the immense demonstration of 13 May, to the cry, ten years after de Gaulle's coup d'état, of "Ten years is enough!" It was, to be sure, a political slogan, in that it was directed against de Gaulle, but it was also a defensive, negative slogan (against de Gaulle). In the huge column one could also hear some isolated shouts, mainly the anarcho-syndicalistic cry of the CFDT: "Workers' Power!" And then there were a few shouts from the groupuscules: "Serve the People!" "Support the workers!" In addition to the defensive political slogan ("Ten years is enough!") there was also a powerful expression of proletarian internationalism: "Down with US Imperialism!" "The NLF will win! Victory for Vietnam!" But if we want to examine what the mass political slogans ("Down with imperialism," "Ten years is enough") concealed, we find, on the march of 13 May, slogans of the economic class struggle: "We want rises! No more redundancies! Guaranteed jobs! No more timed production! Stop the crackdown on the unions!,: etc. The most extraordinary thing in the extraordinary encounter which this procession of hundreds of thousands of workers, university and secondary-school students, and young intellectual workers represented was the objective discrepancy between the slogans which predominated among the workers, and the slogans which predominated among the students and intellectuals. The students and intellectuals (with Sauvageot and Geismar at the head) were asking not just for a change of government ("Ten years is enough," "Down with de Gaulle! "), but, simply, for "the revolution." This "revolutionary" call subsequently took the form, on occasion, of the anarcho-syndicalist slogans (which represented a synthesis of the anarchism which was dominant at that point among the students and the revolutionism of the "doctrinarians" of the SNES-SUP and the UNEF): "Workers' Power! Student Power! Peasant Power!" But the immense mass of workers had very different aims in mind, which took the form of defensive political slogans: "Ten years is enough!" and, massively, slogans of the economic class struggle. Who stopped to think about this discordance? Yet it was this which dictated the entire tone of everything that followed the May events (in both a chronological and an historical sense). It above all conditioned the form of all subsequent encounters — which rarely succeeded, and were more often either fragmentary or, frankly, non-existent — between the workers actions (the general strike) and the actions of the students and intellectuals. The students, for their part, all sought to outdo each other in their burning desire to "serve the people" and "help the workers," and in this spirit they went to the gates of the factories to offer their services. In the beginning the gates opened for them almost everywhere, but later (with certain exceptions, for example Flins, where there are no gates) they remained closed, to the great disillusionment of the student militants. In some cases (Flins, Cléon, Nantes, Sochaux), the students were able to participate directly in the violent battles provoked by the intervention of the CRS in the factories. One young student even died, drowned at Flins, and two workers were killed by rifle fire at Sochaux (where the CRS also left a number of their own men on the ground). But as a general rule the mass of workers did not respond to the enthusiastic invitation of the students. There was an all-too-apparent gap, and consequent lack of understanding, between the utopian (ideological-"political") hopes of the students and the immediate demands of the workers. Some students, in a rather too simplistic fashion, discovered the reason for this in the "betrayal" by the leaders of the CGT and the PCF. This is simplistic because it is not a Marxist-Leninist explanation to believe in the determining role of leaders when a mass movement of these proportions is involved. The truth is that the entire working class, and not just its leadership, was not, in general, at all disposed to "follow" the suggestions of the students, which were based more on a dream-experience than on an understanding of reality. The working class felt that it ran the risk — given the manifest inexperience of the students in the class struggle — of being dragged into what has to be called, for lack of a better word, an uncertain adventure. It is for this reason that the working class continued, on its own, to follow its own path, informed by its own experience. This, of course, was not and could not be the path indicated for it in a flurry of proclamations by the student "leaders," Geismar, Sauvageot and later Herzberg — proclamations echoed publicly and with glee by the bourgeois radio and press. (The bourgeoisie is not as stupid as the student "leaders" thought.) (Incidentally, Geismar and Herzberg were not even students, but rather teachers and researchers: Geismar was a member of the PSU and Herzberg — who was immediately expelled — was a member of the PCF.) It is also for this reason that the working class looked so surlily on the great meeting of the PSU (Unified Socialist Party, which at that time should really have been called the University Socialist Party) at Charléty. Thus the working class in practice resolved its own problems alone: first of all the problem of its demands; then, also, in some cases, the problem (which was absolutely secondary from the point of view of the existing situation) of its relationship with its own leaders. This second problem, in any event, is its own business and has nothing to do with the students. The students ought to get this simple fact into their heads, even if it is hard for them to understand it. The working class went back to work. It often did so in an atmosphere of victory, with its banners raised. In other cases, it had to face often serious problems with certain union leaders. And then everything fell back into the normal order of things. But some things had changed. Wages had been temporarily endowed with a greater purchasing power. The unions had won basic civil rights inside the factories (at the Citroën plant, this was really a great victory). And, above all, the working class now had etched in its memory (and this is a definitive inscription) the knowledge that the bosses, the Government, and the state apparatus had been thrown into stark fear overnight by the action of the masses, that action was therefore possible, and that such action, one day, could lead to something that the working class has heard spoken of — since the Paris Commune, since 1917 in Russia and 1949 in China: the Proletarian Revolution. When the working class had gone back to work, the students "continued the struggle" with the famous slogan, "This is only a beginning, continue the struggle!" Beginning of what? And what struggle ? When I ask these questions, it does not mean for a moment that nothing at all had begun. On the contrary, something very basic had begun for the university students, for those in the lycées and the technical schools, and for the young intellectual workers, but something which is only the barest beginning. Beginning of what? The students think it was the beginning of the revolution. In the long-term sense, of course, this is true, but then, this beginning was not something they achieved: it is the achievement of the working class which did not wait until May to "begin the struggle," which indeed it has been waging for more than a century. If this is so, what, then, has begun for the students? "Continue the struggle!" Well, the struggle continued, or rather in reality it declined and, in the coming months, it will, at least in France, move more and more towards the complete disintegration, at least in the student milieu, of what the students call, in overly ambitious terms, the "Student Movement." "This is only a beginning. Continue the struggle!" Beginning of what? What struggle? This leads to the next question: what does the term "Student Movement" mean? I would like to begin with the observation that, at least in France and Italy, but also in Germany, Spain, and the USA, the "Student Movement" carries a title which does not accurately indicate what it is in reality. In this respect, May 1968 in France was a kind of scientific experiment, a verification-test in which many hitherto hidden facts came to light. Above all, the following fact: if the students, in the strict sense, had supremacy and the principal role, at least at the start of the events, they also had the tendency to pretend not to recognize the active presence of other strata, more important than they. In the first place, school students: the lycéens and the pupils from the technical schools, and even from the upper grades of the elementary schools. Then, above and beyond the school students, there were large and highly differentiated strata of young "intellectual workers": young doctors, lawyers, artists, architects, engineers, journalists, low-and-middle-level white-collar workers, technicians, teachers, researchers, and so on. The fact is that the too-vague and unilateral, and hence inaccurate expression "Student Movement" covers a whole series of activities which converged in May, generated by various strata of young students and various strata of young intellectual workers. This great diversity explains many things which occurred in May, both convergences of action (e.g. the stupendous posters of young artists and architects) and clashes and even divergences. Amid this great diversity one common element prevailed. A common ideological source dominated this mass, of petty-bourgeois origins: petty-bourgeois ideology was dominant. But this same diversity helps explain the different variants of petty-bourgeois ideology that were expressed during May: the dominant libertarian anarchism, but also Trotskyism, anarcho-syndicalism, Guevarism, and the ideology of the Chinese Cultural Revolution. It should be said that the direct influence of Marcuse, which was so significant for the student youth in Germany and Italy, was practically nil in France. Another observation. The title "Student Movement" lends itself to a good deal of ambiguity in the light of what I have just said. To be sure, the students tend to call their actions a "Movement," which is understandable from the point of view both of their intentions and of their admiration for the Workers' Movement. But it is difficult to give them full rights to this title. For in my opinion, if a movement like the Workers' Movement deserves its title, that is because it is the Movement of a social class (the proletariat), and furthermore of the only objectively revolutionary class. The university students, secondary school students, and young intellectual workers do not constitute a class, but rather "middle strata" with a petty-bourgeois ideology. Moreover, they are not objectively revolutionary even if some of their members may become authentic revolutionary militants (Marx and Lenin were, precisely by their social origins, petty-bourgeois intellectuals). That the "Student Movement" is not a real Movement, i.e. a united movement, was made clear in May by the conflicts and serious divergences in both initiatives and actions, and by the fact that the Student Movement, in some cases (e.g. at Charléty), let itself be led by the ideologues of a political party, the PSU, whose basic orientation was not a student one. Having said that, and without wishing to deny our student comrades the right to call themselves a "Movement" — since this expresses their aspiration for unified action and a unified organization which will go beyond scholastic and professional institutions and experiences and attack the whole structure of the capitalist state — it is essential to put this movement into proper perspective. The following fundamental fact must be taken into account: this is not a movement which concerns one or two countries, but practically every capitalist country and even a number of socialist countries. It began fifteen years ago, made some notable advances, and then had some spectacular failures in a number of countries (who still remembers the magnificent Turkish student movement, crushed by the local fascist dictatorship? ), before culminating in May 1968 in France. A long-lasting international movement, born in 1955 and alternating victories and defeats, regressions and then spectacular recoveries right up to the present day. What, then, is this event without historical precedents, an event which certainly is irreversible notwithstanding its inevitable defeats, which, having begun, may and certainly will meet with future failures, but will not stop again? To explain it, on the basis of my limited knowledge, I will present the following fundamental hypothesis: this international movement is one of the spontaneous forms of the class struggle, waged — generally in utopian-leftist forms — in a petty-bourgeois environment and provoked, in the final analysis, by the crisis of the present phase of imperialism, the phase of its death-agony. It is not terribly difficult to find evidence for the impact of the international anti-imperialist class struggles on the birth and development of this Movement. To name only the most significant, let us remember the effect on young students and intellectuals of the war in Algeria, the Cuban Revolution, guerilla war in Latin America — where "Che" met a heroic but politically costly death — the prodigious and victorious struggle of the Vietnamese people against the aggression of the world's greatest military power, the Chinese Cultural Revolution, the violent revolt of black Afro-Americans in the large cities of the US and the Palestinian resistance. These anti-imperialist struggles have met with an extraordinary receptivity among the contemporary youth of our countries, including young workers (let us not forget that in France it was the proletarian and peasant youth who were mobilized for the Algerian war, that it was they who paralysed Salan's "putsch" and made his officers hesitate and that they have not forgotten this lesson). Naturally, this receptivity would not be so profound if the succession of events which have punctuated the years from 1930 to 1960 had not shaken bourgeois ideology to the point of rendering it extremely fragile and vulnerable. Mussolini's fascism; Hitler's Nazism; the Spanish Civil War and the defeat of the republicans under the blows of international fascism; the Second World War; the revolutions that resulted from it in Central Europe, but especially in China; the political and at times social liberation of the countries of the "Third World"; the "victories" as well as the defeats (Korea, Vietnam! ); the direct political and military interventions of the United States, which has become imperialism's only international gendarme as a result of the weakness and contradictions of its "allies"; in short, the public demonstration of the political and ideological impotence of the bourgeoisie's gigantic economic and military forces — all these events have reduced almost to nothing, if not entirely annihilated, the power, still impressive today, of traditional bourgeois ideology. This is an historic fact of primary importance, which it would be a very serious error to undervalue, this little-mentioned but open defeat of the dominant ideology, which is the ideology of the dominant class. It is a defeat which extends around the entire world. This defeat has created a vacuum, a wide-open door, which leaves Marxist-Leninist ideology virtually hegemonic, even if petty-bourgeois strata in revolt seek the way to Marxism-Leninism in "infantile," utopian, ideological forms. After all, we know that utopianism (anarchic, anarcho-syndicalist, neo-Luxemburgist and generally "leftist") is only an infantile disorder which will be cured if, as Lenin said, "it is properly treated." We should not, therefore, be too surprised that the combined effect of the prestigious examples of the victorious struggle against imperialism, on the one hand, and of the void opened by the virtual defeat of bourgeois ideology, on the other, should have opened up a vast battlefield for the ideological revolt of the student and intellectual youth. In addition to this, if one considers the tendential development of the economic crisis of imperialism, which affects the material existence not only of the increasingly exploited working class, but also and perhaps especially, for the first time, directly that of the petty bourgeoisie, even in its relatively well-off strata (intermediate cadres, engineers, teachers, researchers, etc. ), one will not find it surprising to see one's own children, distressed by the unemployment that they know is waiting for them, hurl themselves directly into the battle. Politically, economically and ideologically, the death-agony of imperialism has created the conditions for an attack by petty-bourgeois youth on certain capitalist apparatuses of the State, first among these being the apparatuses of ideological indoctrination, where bourgeois ideology now shows its incurable weakness: the educational system. My hypothesis, therefore, is that the Movement of the young students and intellectuals, on both a national and international level, must be considered as an ideological revolt (N.B. : an ideological revolt is not, in and of itself, as the students too readily believe, a political revolution) which first attacks the apparatus of the educational systems of the capitalist countries. For now, this is the stage at which things are. But I think that if one knows where things come from and in what historical depths they have their roots, one can reasonably predict where they are going, or in any event where they are tending, and where they will indeed end up, after numerous and often serious vicissitudes. This in fact is not the first time that the capitalist countries have been a theatre for the ideological revolts of their young students and intellectuals. The revolts of the 1920s, surrealism in Western Europe and the Proletkult in Russia, were also ideological revolts. But, for reasons which relate to the world situation of that time, the strength of imperialism and the power of bourgeois ideology — or for other reasons (in Russia) — these movements did not fulfil their promise. They never got beyond the stage of infantile disorder, at least not in Western Europe. Is it necessary to remind ourselves that masses of youth were also mobilized, with great enthusiasm, into the "ideological revolt" of the fascist movements in all of Europe and Japan before the last War? But that revolt, odiously exploited by the fascist leaders whom the big bourgeoisie had adopted as political leaders to fight against the working class, was distorted and made rotten by the horrible methods of the fascists, and then massacred in the wars of aggression of the Axis powers. Things are completely different today. Fascist movements today have practically no chance at all of recruiting legions from among the student youth, in spite of the very real, objective and even imminent dangers of a neo-fascist reaction by the ruling class. The bourgeoisie had better resign itself to the fact that it has definitively lost its ideological hold on the best of its young people. It is because of this fact that we can say, with no fear of being mistaken, and notwithstanding the inevitable defections (which at times can be dangerous, however, on account of the objective anti-communism of certain of their elements), that the world-wide ideological revolt of students is objectively and definitively progressive, and that it already plays a positive role which cannot be ignored, of course at its own level and within its own limits, in the international class struggle against imperialism. The whole problem, the crucial problem, that the Student Movement must face and which it has not yet faced save in largely mythic terms, is this: under what conditions, within what time-span, and after passing through what tests, will the Student Movement succeed in establishing a lasting juncture with the Workers' Movement and finally merging with it? At this point it is necessary to introduce a second fact. This fact requires a lot of courage to face squarely, because it is serious. And, precisely because it is so serious, it has not yet really been faced squarely. It is something which, in terms of the international class struggle, is deplorable, but, unfortunately, it is an incontestable fact. Our Communist Parties had momentarily — we hope — but effectively lost ideological and political contact with the students and young intellectuals. The fact that efforts have been made since May to re-establish contacts are simply the proof and absolute demonstration that this contact effectively did not exist in May in France. I think that the same thing is happening in other countries. The fact that Longo judged it indispensable to receive personally a number of "leaders" of the Italian student movement is also proof that the Communist student organizations were not able, on their own, to ensure in a normal way the contact which they had lost. The fact is that in May the Union of Communist Students (UEC) was completely overwhelmed by the events. The young masses — students, intellectual workers and even a number of workers — followed other leaders, not the leaders of the UEC; they fought under other slogans, not Communist ones. They followed Cohn-Bendit and his "22 March" group, which was not even an organization; they followed Sauvageot, who represented a National Union of French Students (UNEF) which was such a ghost-organization that it had not even had a president since the former one resigned; they followed Geismar and then Herzberg, secretaries of the National Union of Teachers in Advanced Education (SNES-SUP); some even listened to Barjonet at Charléty, where the PSU, which presided over the meeting, could not get Mendès-France to speak, even though he was present. They did not follow the UEC, nor the directives of the PCF or the CGT, except in the great demonstration — which had no sequel — of 13 May. There, it is true, they participated with enthusiasm, but they were following the working class rather than the PCF or CGT. En masse, they did not even go along with their own groupuscules which, for the most part, were literally crushed by the Student Movement of May. Why have the Communist Parties, who after all are represented among the students by their own organizations, lost practically all contact with the student youth, to the extent that they were left behind by the latter's spontaneous actions and ideology in May? I only raise the question here, not having the necessary information to risk formulating an hypothesis. Certainly, for France, it is necessary to go back to the effect of the Algerian War on the students, for it was due to this and its aftermath that the UEC suffered two very serious and damaging splits, both of which damaged it greatly and considerably weakened both its membership and its following. We must certainly also recall the influence of the Chinese Cultural Revolution, and the scissionist slogans which the CCP directed at the movements outside China. But all these are only partial elements in a general system of causes, and this system must be analysed both in its details and, most definitely, as a whole, for it concerns not only the youth of a single nation, but the youth of the bulk of the capitalist countries, and also of certain socialist countries. Whatever the ultimate causes are for this loss of contact, one thing is certain: it helped in no small measure to push the youth revolt into what is imprecisely termed leftism. The term is imprecise because it is necessary to specify the various forms which this leftism takes — some of them mutually antagonistic, as the divisions which today reign between the remnants of the groupuscules and their ex-adherents amply prove. It is also necessary to specify that what we are talking about here is petty-bourgeois leftism, and not the proletarian leftism that Lenin wrote about in Left-Wing Communism, a work which is too often cited indiscriminately. It is also necessary to specify that, while Lenin thought that proletarian leftism was "a thousand times less dangerous than Right doctrinairism" for the revolution and relatively easy to cure, as an infantile disorder of the Workers' Movement, Lenin's formulas cannot be applied directly to the leftism of the petty-bourgeois students. We can safely assume that petty-bourgeois leftism, although "infinitely less dangerous than Right doctrinairism" and even less dangerous than proletarian leftism, will nevertheless be infinitely more difficult to cure than proletarian leftism. For it is evident that the petty-bourgeois do not have the "natural" remedy of "proletarian class instinct," but on the contrary have a "petty-bourgeois class instinct," which is incredibly difficult to transform into a "proletarian class position." All these specific conditions render necessary a very special kind of "treatment" for this intellectual and student leftism. As Lenin said of youth movements in 1916, they "must be given every assistance. We must be patient with their faults and strive to correct them gradually, mainly by persuasion, and not by fighting them." But how can we truly define even a line with respect to the complex leftist ideology of the youth, without first of all having satisfied certain absolutely indispensable conditions for not simply advancing into the unknown of an ideological revolt without historical precedent, an ideological revolt which, for all its errors, arrogance and vain defections, is unquestionably progressive as a mass phenomenon. For let us make no mistake, this is a true and proper mass movement, a petty-bourgeois one, to be sure, but a mass one. 1. First of all, employing whatever forms of sociological (economic, political and ideological) analysis are necessary to understand the specifics of what occurred in the sensational May general strike, it is essential to re-establish the historical order of things: hence to assert the historical primacy of the general strike of nine million workers (which swept away the ideology of Marcuse and his cohorts) over the actions of the student and intellectual youth. This analysis will have the immense advantage, if it is really detailed, not only of enlightening the working class about its own forces and resources — and hence about its prodigious powers of revolutionary intervention — but also of educating the young students and intellectuals as to the reality of the working class and the Workers' Movement, of which they necessarily have only a distorted idea, notwithstanding the contacts they have had with some young workers (some young workers are not the working class). This analysis must also bring out the almost total abstention in May of the rural proletariat, the poor peasants and the smallholders, whose demands and anger are nevertheless well known. Why did they abstain? To answer this, one must necessarily go beyond a national frame of reference and refer to the international context, to imperialism and the international struggle against imperialism, and to the very difficult conditions created by the split in the International Communist Movement, the reality and component parts of which cannot be ignored. 2. It is also essential to undertake a profound study of the national and international causes which lie behind the ideological revolt of the students and young intellectuals. This analysis will have the immense advantage of enlightening the youth about the causes which have set them moving; about the necessity of the events that they have experienced as "freedom"; about the difficulties of the blind alleys (impasse) in which they are floundering and will continue to flounder. It will make them understand the limits and errors of the spontaneous forms of petty-bourgeois ideology which governed their historical actions in May; and it will prepare them to unite with the working class, to recognize the principle (affirmed with incomparable clarity by Lenin) of the latter's leadership of the revolutionary struggle, and to confront, in precise terms, the problem which at present torments them: the problem of the necessity of organization (because they sense, and some of them even know, that no political action is possible without organization). Furthermore, such an analysis will enable us to make the workers understand the causes and the sense of the ideological revolt of the student and intellectual youth, and also the causes of the utopian reactions of the students, which, with good reason, disconcerted the workers and made them generally wary — if not actually distrustful. Naturally, an analysis of this nature will have to be carried out, as I think I have made clear, on both a national and international level. 3. Lastly, it is essential to undertake a thorough-going analysis of the reasons which led to the abnormal loss of contact (practical, ideological and political) between the majority of Communist Parties and the youth. Here too we must get to the bottom of things — even if this means bringing in reasons of an international nature, since the phenomenon is one which transcends the framework of any one nation — provided that we do identify the specifically national causes of the phenomenon. Without this, the attempts currently being made by our Parties to re-establish links with the student and intellectual youth run the risk of filling the void which was so fatal in May with methods and a line arrived at au jugé (by guesswork) — i.e. of filling it as best one can, which means not very well. Of course, the results of this final analysis must find their place — perhaps a limited one, but nevertheless an undeniable one — in the analysis of the reasons for the massive rise of all the various leftist ideologies which, without appropriate and patient treatment, risk holding sway for a long time to come over the aforementioned youth. I apologize for sending you such a long letter, promised so long ago. But all this time was needed in order to formulate anything more than simple value judgements or simple factual descriptions concerning May. That is why I am sending you this letter anyway, ten months after May and eight months after the end of your electoral campaign. I know that many of my suggestions are extremely precarious, and there is no doubt that in many cases I have been mistaken. All I ask is that the error be demonstrated to me. I would be very happy if this letter, the first I have written to you knowing it would be published, provokes some analyses which will give us a more clear understanding of the May events. For May 1968, which saw a general strike of unprecedented proportions, represents the most significant event in Western history since the Resistance and the victory over Nazism. 1. Let us be careful about these terms, subjectively revolutionary and objectively revolutionary. The first designates subjective intentions, the other objective capacities of individuals or groups in terms of the proletarian revolution. These terms should not be confused with the distinctions introduced by Lenin, when he defines a situation as a revolutionary one when there is a conjunction of objective conditions (a shattering economic-political-ideological crisis) and subjective conditions (the Party, its line, its link with the masses) which must measure up to the objective conditions for the proletarian revolution to triumph.